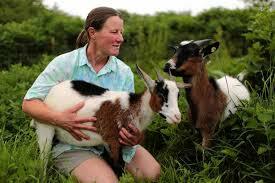 Kim Hunter, proprietor of The Green Goats, spoke regarding the use of goats in environmentally healthy landscape care. Kim is a pioneer in the use of goats to eradicate invasive species, maintain difficult terrain, and provide landscape care without burning fossil fuels or using toxic chemicals. She has worked with Naperville to clear invasives, directed the efforts which led to O’Hare airports use of goats to maintain safe runway, and worked with many other private and public landholders to cure ills with her flock of goats. Come hear a tale of sanity in landscape care in which goats quietly improve the soil, effectively remove weeds, and permanently remove that tenacious culprit of buckthorn! Sponsored by the Riverside Public Library and the Frederick Law Olmsted Society.